Making an old dream come true. 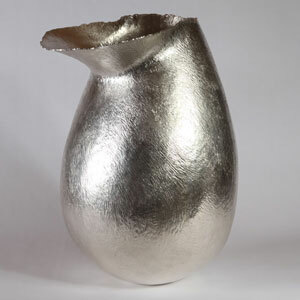 Large art objects in silver. Objects created from a huge unrelenting passion and a skill like that seems lost longtime ago. Traditional skills complemented and alternated with the latest technology, to create inspiring and sensual objects. We studied the limits of the technical possibilities of silver. Investigating how very large objects can be created in silver and especially in pure unalloyed silver. The biggest possible deliverable sheet metal parts were too small for us, so we had to find a way to create fine silver sheets (999 ‰) in such dimensions suitable to create our ideas. The inspiration to create these objects we find in two different directions. There is the influence of Roman amphoras, showing us simple shapes, designed for practical use and in a stunning beauty that still amazes us today. Secondly, our objects are marked by the character of a grand and open landscape, with injures and eroded by sun and wind. Through the process of hammering, stretching and shrinking the silver sheet, we create a surface structure with both a brutal character, and at the same time with the softness of silk, which is reminiscent of desert dunes in their ceaseless motion.